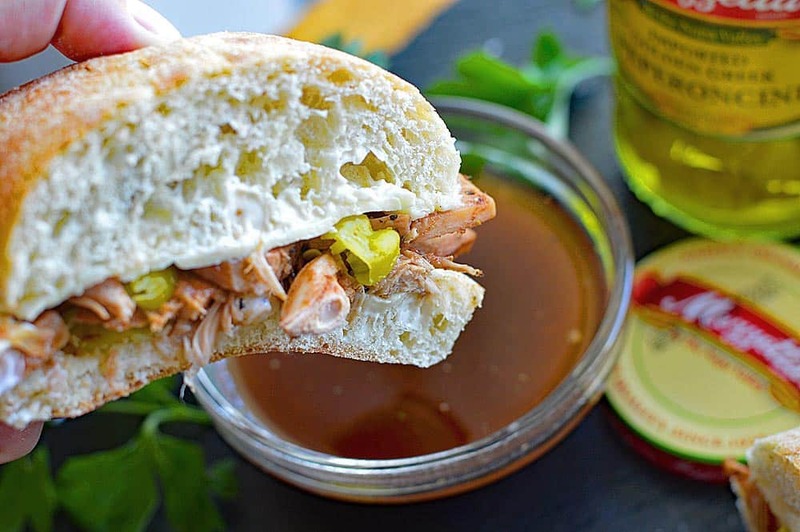 These Peperoncini Jackfruit Sandwiches with Mushroom Au Jus are by FAR one of my favorite recipes that I have created recently! I think you are going to love this one as well. I wanted to keep things completely vegan and to do that, sometimes you just need to get creative. I’ve been taking more to building upon flavors rather than relying on following what ingredients I think should be included … and that is exactly how this recipe came together. 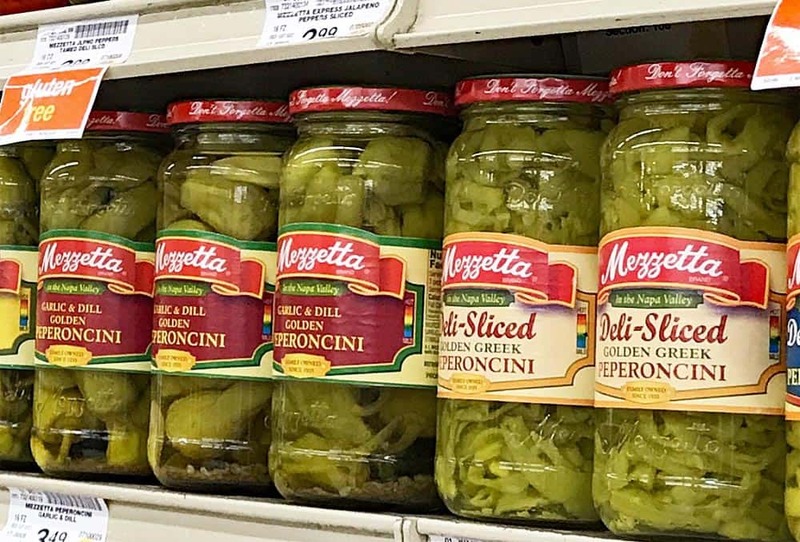 I am partnering with Mezzetta to show how you can “Brighten Every Bite with Mezzetta Peperoncini” and the peperoncini are definitely the star of this show! Ever have trouble using the whole jar of peppers? My newest recipe make it easier than ever to get to the bottom of the Mezzetta peperoncini jar and cook a meal the whole family will love! Jackfruit is all the rage these days. A very trendy, but also very tasty, alternative for those of us who consume a plant-based diet. It comes canned, usually in a salty brine. Drain and give a good rinse, using paper towels to pat them dry. On their own, they have very little smell or flavor, but they take on whatever flavor you add to them beautifully! 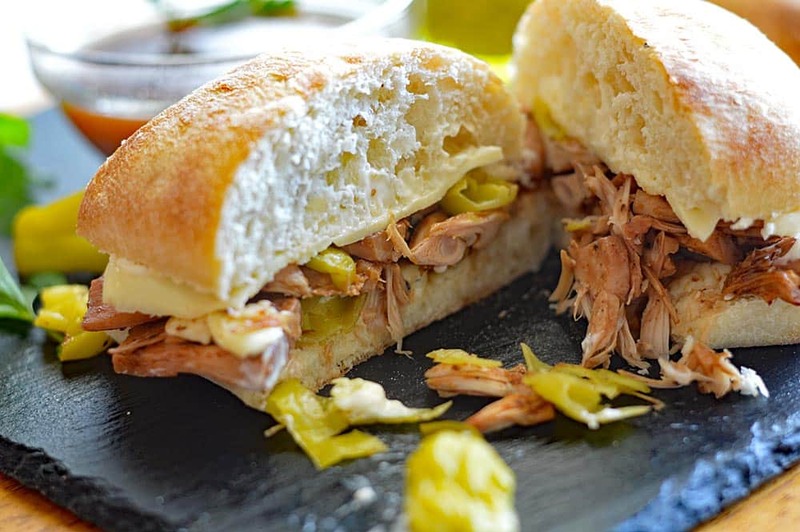 They shred well for pulled “pork”, but I wanted something a bit different for this sandwich. 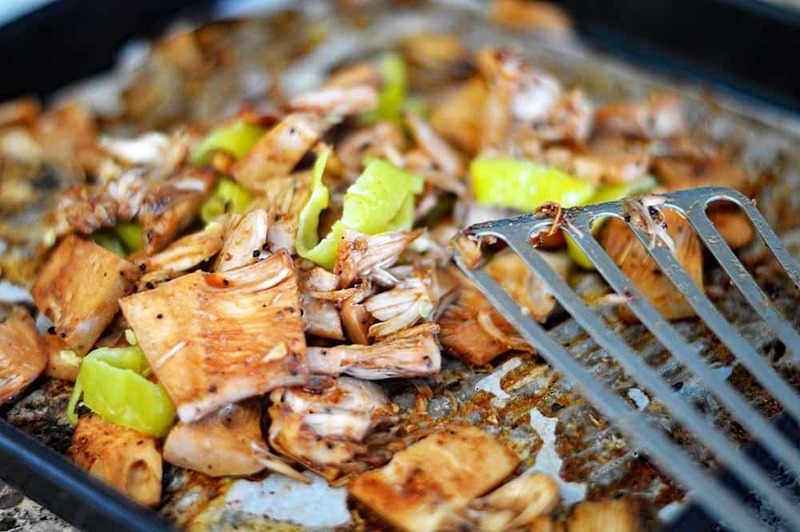 I took each jackfruit wedge and sliced them into three or four 1/4″ pieces, tossed them in the marinade and allowed them to simmer in that marinade for 15 minutes. 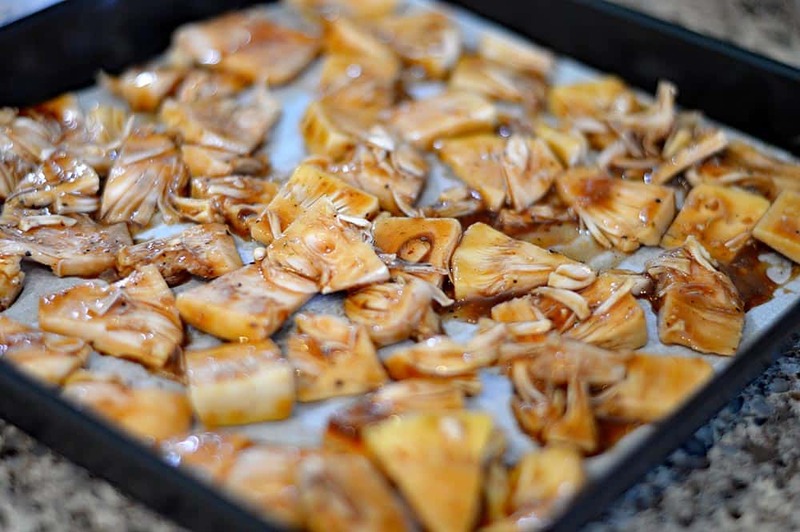 On a parchment lined baking sheet, remove the jackfruit from the marinade and bake at 375 degrees until you begin to see crispy, caramelized edges. I added broth to the reserved marinade and simmered to allow the flavors to meld. Then, just before serving, I strained out the solids. In the last 5 minutes or so of baking, add the sliced peperoncini. Doesn’t that look amazingly flavorful? I used ciabatta rolls with a layer of vegan mayonnaise, then vegan cheese slices. Try to find a meltable vegan provolone or Swiss style cheese. The final step is to toast your creation just until the cheese begins to melt. I mean, just look at this deliciousness! 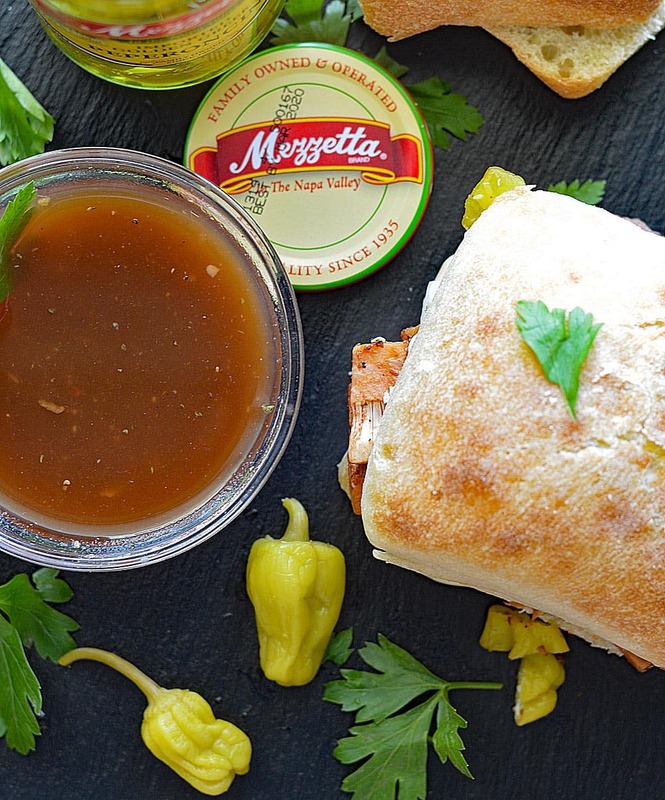 Be sure to visit Mezzetta and enter their national sweepstakes for a chance to win 52 meal kits for 2 from Chef’d! (All who enter will receive a 10% coupon). 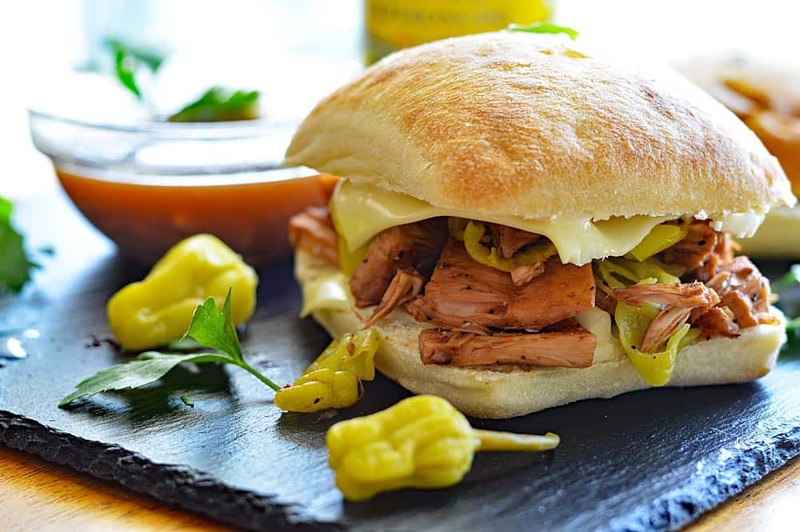 Did you make this recipe for Peperoncini Jackfruit Sandwiches with Mushroom Au Jus? How do you enjoy your peperoncini? Leave a comment below. Using a tsp of oil in a large skillet, add the onions and cook until translucent. Add the mushrooms, sauteeing for a few minutes before adding all remaining ingredients for the marinade EXCEPT BROTH. Add the sliced jackfruit to the marinade. Allow to simmer on low for at least 15 minutes or so. Remove JUST the jackfruit and place onto a parchment lined baking sheet, baking until the edges start to get brown and caramelized. During the last 5 minutes of baking, add the sliced peperoncini. Add the broth to the marinade and simmer while the jackfruit bakes. Strain the solids and reserve the au jus. 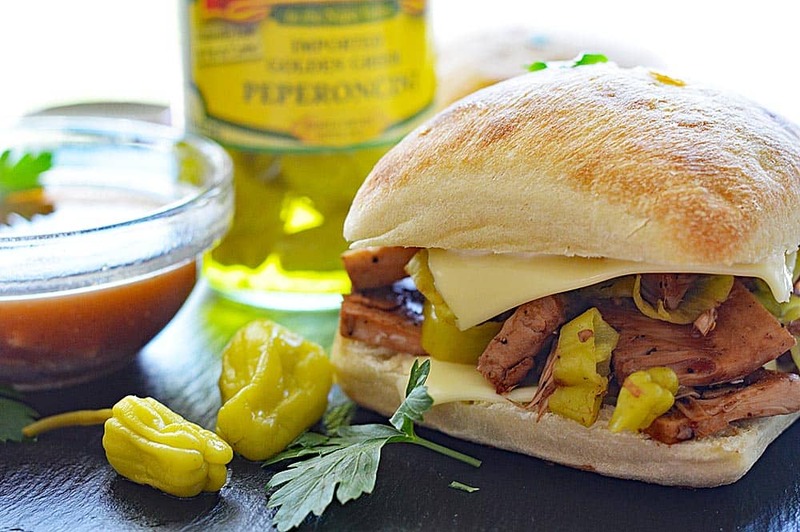 Spread vegan mayonnaise onto each side of a ciabatta roll, followed by a slice of vegan cheese. 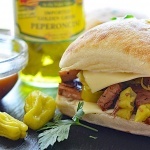 Add a generous amount of the jackfruit/peperoncini mixture (this recipe makes 4 sandwiches) and top with the other half. You can place in the oven or toaster oven to melt the cheese. Serve with warm au jus. Oh my gosh!! This is such a delicious sandwich. I can’t wait to try it. You always make amazing Jack Fruit recipes. This looks so delicious!! 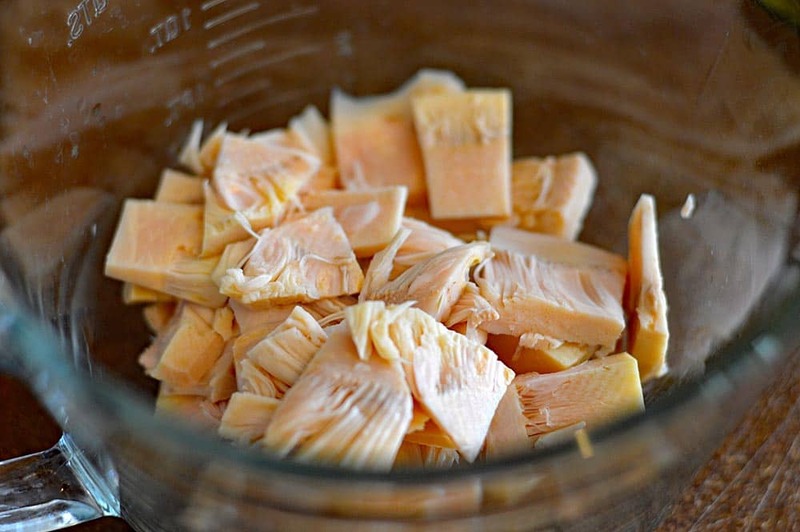 I absolutely love jack fruit when it is sweetened, but have yet to try it savory. I can’t wait to! Looks so yummy!